← ANZAC Day, Lennox Head and Baby Wearing! This week has been huge, in terms of Goldie’s communication and mobility skills. I’m talking huge! Like, I’m surprised the kid can even sleep! She just started pulling up to standing TODAY! Yikes! This makes me sad, scared and excited all at once. Sad because my days of having a baby are numbered, and in a few months we will have a toddler on our hands. Scared because of the obvious, falling (although, she’s surprisingly steady thus far). And, excited because it’s so much fun to watch their faces and see their excitement when they learn new tricks! Now on to more EC news… A couple days ago, I went to an ABA (Australian Breastfeeding Association) meeting. The topic at the meeting was EC, and there was supposed to be a guest speaker. But, for some reason or another, the guest speaker couldn’t make it and I sort of ended up doing the talk, or rather sharing my experiences of doing EC with my two girls. It was very informal and sort of question and answer type of thing. I think it’s important for people to realize that the whole reason for doing EC is not to catch every single wee and poo, but more to bring awareness to your baby’s body and to his or her needs. That, eliminating is not a ‘yucky’ thing… it just needs to be done in an appropriate place. Also, that EC is an ever evolving form of communication between a carer and the baby, and that the whole process can’t really be judged as being ‘successful’, or not depending on how early a child is toilet trained. Other than the obvious benefits of early toilet training, there are other not so obvious benefits to doing EC, like trust, confidence and independence. Another thing Goldie has started doing is crawling towards the potty, or towards me when she has to go. Margo also did the same thing around this age. She also gets VERY mad at me if I try to take her to the potty or sink and she doesn’t have to go. The wee frequency is much less, so I have to remind myself to not take her as much, as I don’t want to annoy her to the point of going on a potty strike. 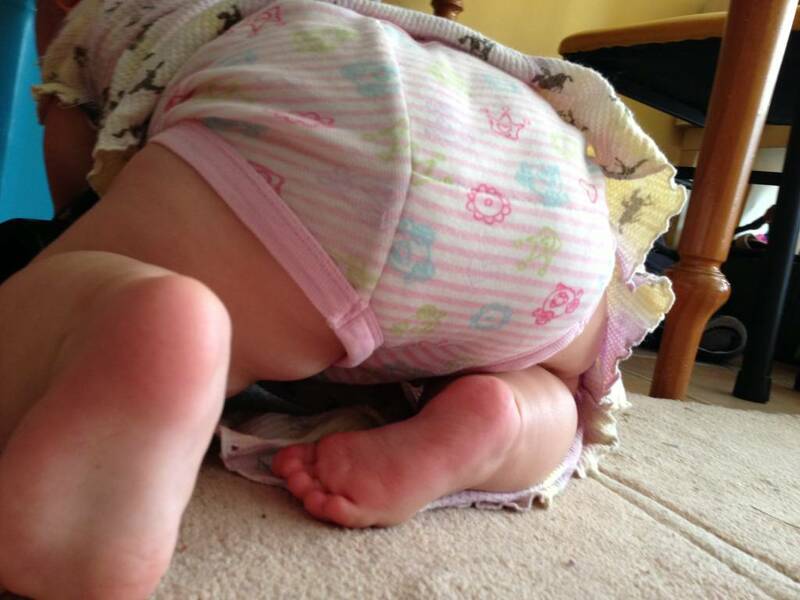 I’m so curious to see what will happen when Goldie can walk… it was around that age (12 months) that Margo was sort of out of diapers all together. I’ve heard that in many cultures where EC is the norm, that walking is usually timed with ‘potty training’. As soon as Margo could point to the potty to tell me that she had to go, I didn’t even really have to ask her anymore, and that was the end of the diapers. I wonder if it will be the same with this little one? Have any of the readers out there done EC at around 9 month-12 month mark? What forms of communication did your baby use to tell you that they had to go? My little guy would craw to his potty too. He would also grab his little potty and bang it up and down if we weren’t paying close enough attention. He was about 9 or 10 months when he started that. Oh, it seems like every time I sit down to blog an entry I get a floor nugget too! I so missed reading about you all! I had my first poo on the carpet after 3 years of EC! Oh, it ALMOST ended up in her mouth too! I try not to laugh but man when the worst place for a poop to happen actually happens it just seems just that more “eww” because you aren’t used to it. Never fear, Mini Moose actually got poop in his mouth…to be fair it was an undigested bean and then gave it to me when it seemed off…but…still…gag retch erk.